With the Z390 Phantom Gaming 4, ASRock has dropped the flashy LED lighting integrated into the heatsinks and offers users a further cut-down version at an entry-level price point ($140). The Z390 Phantom Gaming 4 keeps the same black and grey PCB theme, it removes the rear panel cover from the other Phantom Gaming boards outlined above and removes one of the power delivery heatsinks; this model is advertised as having a lower spec 10-phase power delivery. Also omitted from the Z390 Phantom Gaming 4 is Steel Slot protection. The board has two full-length PCIe 3.0 slots which run at x16 and x4 respectively, along with a total of three PCIe 3.0 x1 slots. Users looking to run SLI on a budget will need to look at ASRock's Z390 Phantom Gaming SLI board which is similar but costs $20 more. The memory capability of the Z390 Phantom Gaming 4 consists of support for up to 64 GB of DDR4 memory and up to DDR4-4300. The board offers six SATA ports with support for RAID 0, 1, 5 and 10 arrays. Included are two PCIe 3.0 x and SATA compatible M.2 slots and on the cooling front, the Z390 Phantom Gaming 4 offers a total of four 4-pin fan headers. On the rear panel, the Z390 Phantom Gaming 4 has two USB 3.1 Gen2 consisting of a single Type-A and Type-C port with two USB 3.0 Type-A and USB 2.0 ports. A single LAN port powered by an Intel I219V Gigabit networking controller and the three 3.5 mm audio controlled by a Realtek ALC892 HD codec are also featured. Just like the Z390 Phantom Gaming 6, the Z390 Phantom Gaming 4 has a trifecta of video outputs which are comprised of a D-sub, a DisplayPort and a single HDMI output. 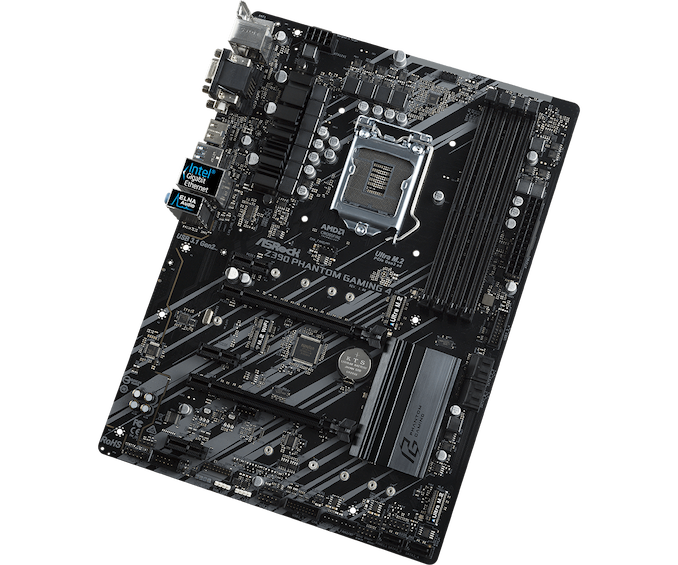 With a much lower entry point into the market than the bigger Phantom Gaming 6 and 9 motherboards, the ASRock Z390 Phantom Gaming 4 has a price of $140 which makes it the third cheapest Z390 board in ASRock's current SKU list and with Intel Gigabit LAN and a mid-ranged Realtek ALC892 codec, the Gaming 4 is seemingly targeted at gamers not looking to spend allocated budget on flashy aspects such as RGB and SLI support, but instead sticks to the important core componentry with minimal fuss.